The journey began at the end of March, when Avnish and Anita set off on the first leg of their Spring 2019 trip. Arriving in Kathmandu the Goyal’s were first introduced to life in Maiti with One Family, visiting shelters, the HIV Hospice that so many rely on, and the Thankot Interception Point where the dedicated team aim to stop human trafficking in its tracks. After a second charity visit to Street Child, where Avnish and Anita learnt about the UK-based charity’s focus on education, child protection and livelihood for the street dwellers in Nepal, the rally was about to begin. 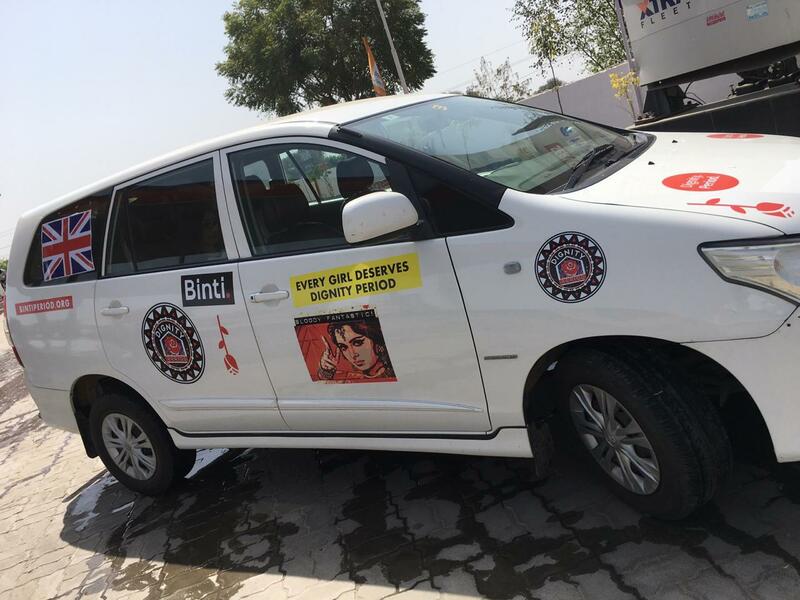 As a proud supporter of BINTI International, with Anita Goyal acting as Patron since the middle of 2018, it was an honour for HGF to join BINTI on their 5 cities for 5 years rally, commencing in Gurgaon and ending in Chandigarh nearly 2 weeks later. The rally began with a Deaf and Mute school in Gurgaon before covering 350km by car to Ranthambore. Spending the gruelling 7-hour journey in a specially designed car, the rally team’s goal was to not only educate young girls on menstruation but also to #smashshame and raise awareness. The rally proceeded to travel to Kotputli, Jaipur, Udaipur, Amritsar and Moga; delivering the powerful education to over 1300 children in total and providing reusable pads to all the schools involved. With 88% of women in India relying on a dirty rag when they menstruate, the rally team has successfully changed the lives of hundreds of girls and given them the menstrual dignity which every female deserves. During the course of the rally, Avnish and Anita had time to visit a couple of our other project partners based in India. Dedicating a day to other projects in Jaipur, the team were able to visit the Taabar project run by the British Asian Trust, and the Vatsalya programme overseen by Lily Against Human Trafficking. There was also time to visit the Partition Museum which HGF hopes to support in the near future, and other sites around Amritsar. After leaving the rally, Avnish and Anita’s journey took them to New Delhi for the final instalment of their Spring trip, with both speaking about their charitable endeavours and the future of next generation philanthropy at the Women’s Economic Forum.